Robin and I have been casting about trying to decide where our next camino journey will take us. We have twice been down the Camino Frances in winter, and have enjoyed both of those pilgrimages immensely. However, one hitch has always been Robin’s choir schedule. She sings with St. Mary’s Cathedral Choir in Portland, and has been there for close to ten years. We have tried to accommodate her choir schedule by nestling our caminos in between Christmas and Easter. Having said that, on our first pilgrimage, we did spend Christmas on the camino. This coming year Robin would like to sing straight through Easter Sunday. 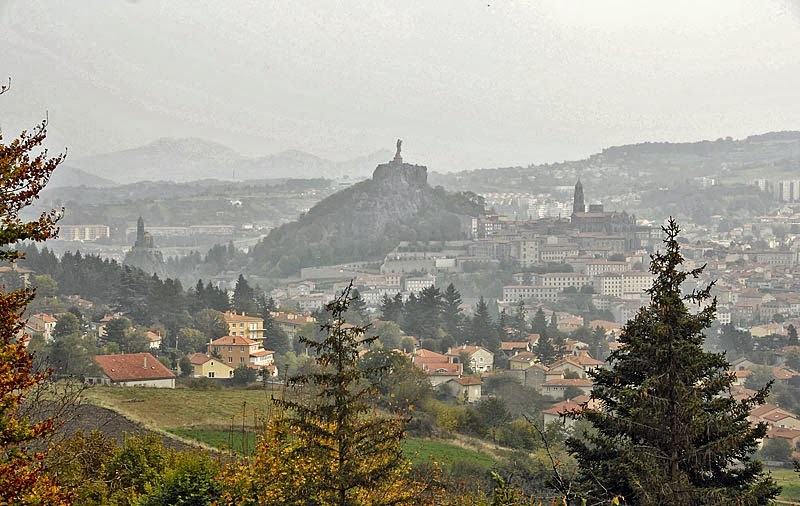 So, for the moment, our plan is to leave for Europe a couple of days after Easter, and head to Le Puy en Velay. We have conjured up an itinerary that has great appeal as it will take us through both France and Spain with lots of varied terrain, beautiful scenery, and will lead us back to Santiago. The route we are planning will take us from Le Puy to St. Jean Pied de Port, then via the GR 10 hiking trail to Irun where we will walk the Camino Norte until it intersects with the Camino Primitivo which we will then follow to the Camino Frances, then on to Santiago. This is, for us, an ambitious undertaking. The main concern, at the moment, is adapting to walking in hot weather. Robin definitely prefers cool weather to hot weather. In truth I do as well, but I know I can walk in warmer (even hot) weather. Robin is less sure. We will be leaving Le Puy late in April so that bit is okay. We will be walking the Norte, and Primitivo in June, and July. Our hope is that both of those routes will be a bit cooler due to proximity to the coast, and the higher elevations of the mountain passes. We will see. All pilgrimages have challenges to be embraced. I feel certain this one will be no different. The month of May on the Le Puy route will certainly be crowded (this will be new to us). The Norte and Primitivo routes are gaining popularity so there might be more pilgrims there as well. The heat, the rain, the cold (in the early days), even the crowds are all things that can lead to one of those “why am I doing this” moments. We all have them at some point in a pilgrimage. The trick is to acknowledge them for just what they are, then offer up a tip of the hat, and move on. Easier said then done? Of course, but still doable. That is the practice (learning to follow your heart, not your ego) of being on pilgrimage. Good luck being on the Norte during prime beach tourist season! You're not going to fight pilgrims for beds but you will be competing with the Spaniards on vacation from what I have read. Lucky for you, you'll be in good enough shape for the longer mileage between towns and lodging too. I'm planning to walk the Norte in spring 2015, so I am interested to hear how your experience is. Heather, this will indeed be new territory for us in more ways than one. Maybe a little lesson in patience, and understanding (not just tolerating) the needs of others will be just the thing we need. Once we move beyond our concept of boundaries we allow the possibility for growth. That opportunity alone will make this trip worthwhile. Check back next June/July to see how we are doing. In the end, we can only try to be the people we want to be.